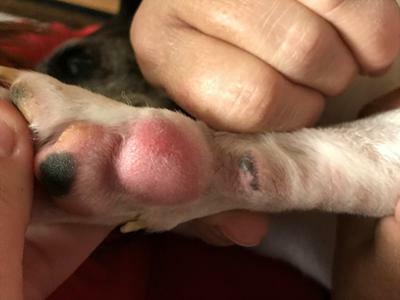 Reader Question - Dog Mast Cell Treatment: We have a 10-year-old Jack Russell Terrier that started limping. We thought it was needing his nails trimmed. We made an appointment to get this done at the vet. Then I noticed a large lump on the bottom of his paw. We called and said we needed to see the vet also. They shaved the area and took a sample. She said it is a Mast Cell Tumor. Can they tell by looking under a microscope that this is actually cancer? They gave us Benadryl and Famotidine to give him. Could it be an infection instead of cancer? This dog is our life. It is not always possible to diagnose cancer by looking at cells under the microscope, but it can oftentimes be done with mast cell tumors. They have a fairly distinctive appearance. The Benadryl and famotidine that your veterinarian prescribed can help with the systemic effects of the tumor, but there is much more that can be done to treat it directly if you are interested. Common options include surgical excision of the tumor, radiation therapy, and/or chemotherapy depending on how aggressive and advanced the cancer is. A veterinarian will need to "grade" the tumor to plan the best form of treatment and give you an idea of your dog's prognosis, which may be quite good. For example, dogs who have grade 1 or grade 2 mast cell tumors that are completely removed or those that can only be incompletely removed but are followed with radiation therapy generally survive for years with no recurrence of their cancer. Ask your veterinarian to refer you to a specialist (oncologist) if you would like to pursue this type of treatment.